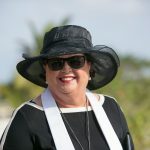 Maybe because I'm an unabashed romantic, maybe because I've been married a long time, but I love to help couples plan, and to perform Wedding Vow Renewal ceremonies. This husband from Louisville, KY contacted me about a surprise renewal for this wife of 11 years, at which he planned to give her a new ring. He was also involved in helping plan the words they would say to each other, for as he put it "something quick, simple and early" and on the beach of course. 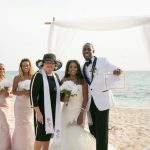 My husband and I picked them up before 8am at the Marriott Resort on Seven Mile Beach where they were staying and took them down to the Governor's Beach which I thought would be fairly quiet that early in the morning, and it was. They wanted the ceremony right down the beach, almost in the surf. 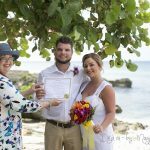 I always give my renewal couples a dated, signed and witnessed Wedding Vow Renewal Certificate as a tangible reminder of this significant event. Signed and sealed with a glass of champagne, followed by Mimosas out of respect for the early hour. Quick cuddle, also showing off the beautiful new ring. She really had no idea, he managed to quite surprise her. This is a spectacular beach. Only a few early walkers were out. It is always clean thanks to the Department of Environmental Health's clean-up crew, who I really appreciate. which includes transportation and champagne all for one low price. couples can celebrate any milestone they wish, in their life together. 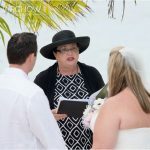 Call me to start planning your personalised Cayman Wedding Vow Renewal today (345) 5256551.